The major work of the world’s longest sea bridge was completed Sunday as scheduled, after its lighting system was installed and tested, authorities said. 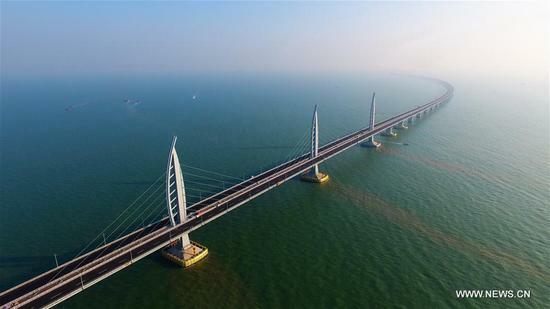 It took six years preparation and eight years to build the 55-kilometer-long bridge linking Hong Kong, Zhuhai and Macao. In the next month, engineers and constructors will test the coordination of the bridge’s various systems and equipment, and proceed with inspection and cleaning work, said Zhang Jinwen, project director with the Hong Kong-Zhuhai-Macao Bridge (HZMB) Authority. Finance, News, Science-Technology, Translations Bridge, Delta, Hong Kong, Macau, Pearl, zhuhai. permalink.